Do you want to know how your literary and artistic works are protected under the law? How does copyright work? Do you really own what you think you own? Any information provided here should not be considered legal advice. If UCF faculty and/or staff members encounter questions within the course of their employment regarding copyright law, the university’s guidelines with respect to fair use, university regulations and/or other official UCF documents, they should contact the UCF Office of the General Counsel. For questions about copyright, fair use, and related general topics, UCF students should contact the Office of Scholarly Communication at the John C. Hitt Library. There are exceptions to copyright (such as fair use) and many other intricacies. The difference between copyright infringement and plagiarism are also often confused. Keep tools and resources handy for learning about copyright topics. Read the UCF Libraries’ Copyright Policies. See UCF Regulation UCF-2.033 Copyright and Works for University Personnel. See UCF Regulation UCF-2.029 Patents, Trademarks, and Trade Secrets for University Personnel. Register a copyright and learn more from the U.S. Copyright Office. Explore information about copyright from the World Intellectual Property Organization. Creative Commons (CC) is a nonprofit organization that provides free legal tools, including licenses. Individuals can use licenses from CC to help share their works (as long as the individuals still retain their author rights). The licenses work alongside copyright and help individuals pick which rights they would like to retain. 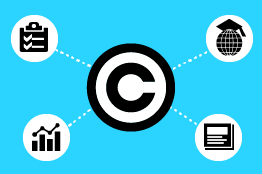 In other words, the licenses offer adjustments to the typical “all rights reserved” standing that happens through copyright. CC can also help with locating works marked as freely available to use. CC is not a law firm, however, and does not provide legal advice. Share your work by choosing a CC license. Search the Commons to find works that others have given open licenses. Because the following four-pronged test is highly subjective, it is difficult to know whether your application of the test will stand up in a court of law. For that reason, UCF has chosen to adopt the guidelines (set forth under 5.-9. of the UCF Use of Copyrighted Material Policy) rather than to ask individuals to apply the four-pronged test. For more information, please see the UCF Use of Copyrighted Material Policy. UCF Personnel should follow applicable copyright law and the above referenced policy. For additional resources pertaining to fair use, please visit the UCF General Counsel’s website, but, in reading these materials or the legal resources posted on the UCF General Counsel’s website, please keep in mind that they do not constitute, and should not be considered a substitute for, specific legal advice. The resolution of legal issues frequently hinges on slight changes in the facts and circumstances, and your particular situation may well be different from those described in these materials. If UCF faculty and/or staff members encounter legal questions within the course of their employment, including those pertaining to copyright law, the university’s guidelines with respect to fair use, university regulations and/or other official UCF documents, they should contact the UCF Office of the General Counsel. UCF Students should contact the Office of Scholarly Communication at the John C. Hitt Library.